I will never forget the first time that my husband cooked for me. We hadn't been married all that long and we were living in a little basement apartment. He told me he was going to make something called "Tater-Tot Casserole" and I will confess to you I was a little concerned. I have told y'all that I did not grow up eating casseroles so when I saw the traditional ground beef, cream of mushroom soup, and tater-tots, it was scary. But, as with any new bride, I was a good sport about the whole thing and I will humbly admit that it was DELICIOUS!! Over the years I have tweaked the recipe a little and did away with the canned soups, but this recipe is equally delightful and I know you are going to love it! This next step is something I do simply because I think it gives your tater-tots a better texture in the casserole. It is not necessary. Place the tater-tots onto a baking sheet. Put them into the preheated oven and cook for 20 minutes. While the tater-tots are baking, place a skillet over a medium/high heat and add a little oil. Once the skillet is hot, add the ground beef. Add the onion and garlic and cook until meat is browned and is no longer pink. Once the meat is fully cooked add the flour. Mix together until the meat is coated and cook for 1-2 minutes. Bring to a simmer and let thicken. Whisk together until the cream cheese is melted and smooth. Pepper you think it needs. Now it is time to assemble. Place half of the tater-tots on the bottom of a greased baking dish. Then add the other half of the tots. Then place in the oven and bake for 20 minutes. Look at that YUMMY plate. It is crunchy, creamy, cheesy, and oh-so-good. This is truly comfort food to the MAX. The best part is that, while this is not a light dish, you don't have to worry about all of the salt and preservatives that come from the canned soup because you made this yourself. Oh yeah, it's sooooo good! So hop on the casserole bandwagon tonight and make this GREAT dish! Serve it up with some steamed broccoli, green beans, or even a nice salad. Your entire family is going to LOVE it! While the tots are baking, place a skillet over a medium/high heat and add 2-3 tbsp. of oil. To the hot skillet, add the ground beef, onion, and garlic. Season with salt and pepper and cook until the meat is brown and no longer pink. Add the flour to the meat and stir until coated. Whisk until the cheese is melted and incorporated into the sauce. To a greased baking dish, place HALF of the tater-tots in a single layer on the bottom. Pour the sauce over the tots. Cover the sauce with the other half of the tots. Sprinkle the shredded cheese over the top. Place back into the oven and bake for 20 minutes. 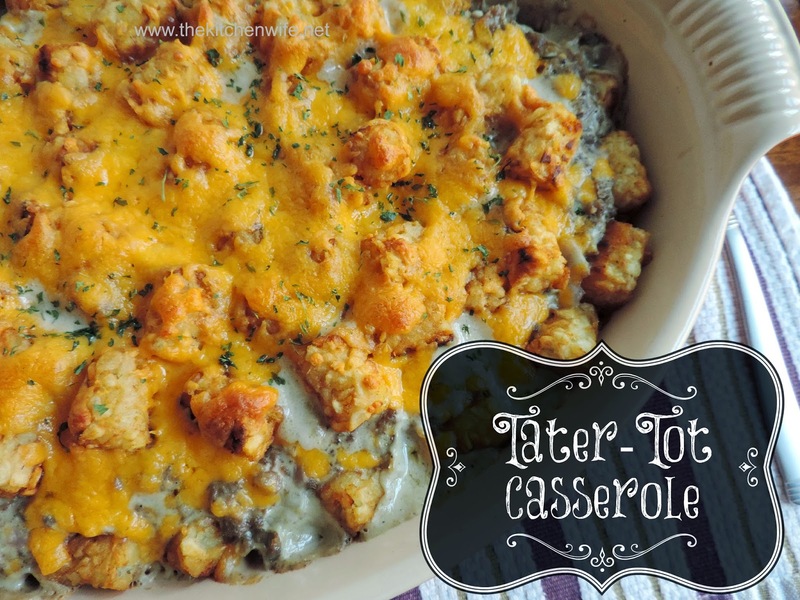 *You do not have to pre-bake the tater-tots, however, I feel it give them a nicer texture in the casserole.